Before the cutscenes of the classic Phantasy Star games were created as sprite-based game graphics, many of them were sketched in pencil like more traditional artwork. 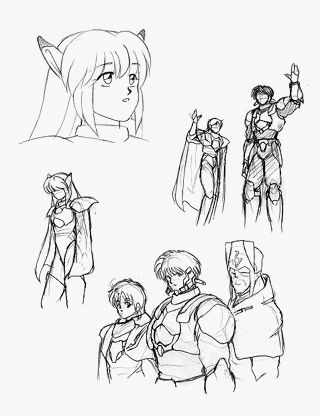 Phantasy Star Collection (Saturn) provides a look at several such sketches for the cutscenes of Phantasy Star IV. For this group, we have several scenes from the game's ending. The large headshot of Rika is from the "snow" sequence just after the final boss is defeated. The others revolve around the departure of the androids and natives of Dezoris: Kyra and Raja. It is interesting that Kyra, Wren, and Rika all lack face detail in these sketches. That was also true of this scene in the game; perhaps even the sketch artist was aware that this scene would be very small in terms of sprite size.